Last week I shared my pinterest board for Malia’s 4th birthday celebration. Well, here’s how her Pink & Gold Princess Party turned out. I designed her party around Princess Aurora from Sleeping Beauty. 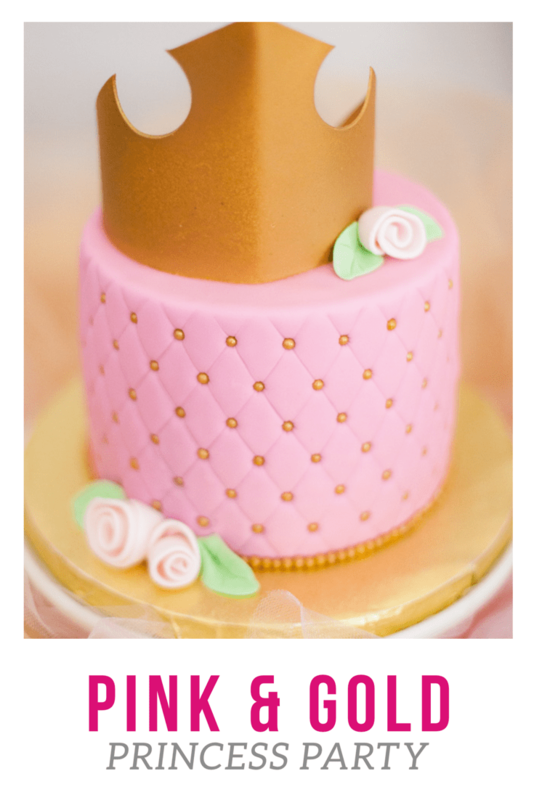 We used different tones of pink, paired with gold and pulled in details from the Disney movie. To keep the party fairly contained, I decided to set-up kids tables where they could do their arts and crafts throughout the afternoon. I found the pink crown at Hobby Lobby and used that as an accent to the focal wall. The gold M was found at Joann’s fabrics and layers of tulle were used to add color and softness to the dessert table. I absolutely LOVE the Sleeping Beauty inspired cake designed and created by Jolene at Batter Up Cakery in Fairfield, California. Her attention to detail is amazing. I love the tufted detailing with the gold pearls and the Sleeping Beauty Crown was the perfect topper. Plus, her cakes are so moist and wonderful. For refreshments I had pink lemonade display in a clear drink dispenser. I found these wonderful milk bottles with lid & straw at Target for $3 for 2. I added the Tickled Pink label with gold ribbon to complete the look. Download a copy of the Tickled Pink label. At the end of the day, each little girl was able to take home the milk bottle as one of the party favors. I went to the local thrift store to find some glassware that I could add gold glitter to. They added the perfect touch of sparkle to the table without adding much to the budget. Malia loves Madeleine cookies so I added hand dipped Madeleine cookies to the dessert table. I used candy melts from Michaels, in pink of course, for dipping. I then sprinkled purple sprinkles on top for a little texture and color. Malia liked calling it fairy dust. For the girls, I set-up kids tables for them to do their arts & crafts. Since the tables were different sizes and colors, I covered them with pink table cloths. I cut them into 2 so that they fit 2 tables. I also used a gold table cloth and cut that into a table runner to add a second layer of detail. For the “Princess Table” I scored a beautiful pink and gold fabric from Joann’s that tied the colors together perfectly. I used gold chargers from Michael’s so that every little princess had their own craft station. Top it with a princess birthday napkin & tiara, it all came together wonderfully. Any princess worth her merit will own a pair of pink converse. It’s even more wonderful when they’re presented to you by Sleeping Beauty herself. We added some crystals for some added bling. My girl couldn’t have been happier. And that, my friends, is how my daughter celebrated her Pink & Gold Princess Tea Party. She fell asleep that night sharing her favorite moments and hoping that Sleeping Beauty would always be her friend. And I’m a happy momma! Have party details you would like to share? Send in a guest blog post to share on our forum!